Evoking Empathy | gURROO - A new generation of innovative minds. In an increasingly expanding world where people and places are constantly connected, it becomes important for individuals to be globally culturally aware in order to play a relevant role in society. Staying regularly informed of news and current events ensures a connection with the rest of the world, thereby enhancing the positive implications of globalization in today’s world. Media – with its inadequate portrayal of contextual information with regards to current events or with fragmented bits that people absorb – becomes a critical factor in determining the nature of people’s awareness of cultures. A pivotal role is played by media in determining individual perspectives towards global cultures. 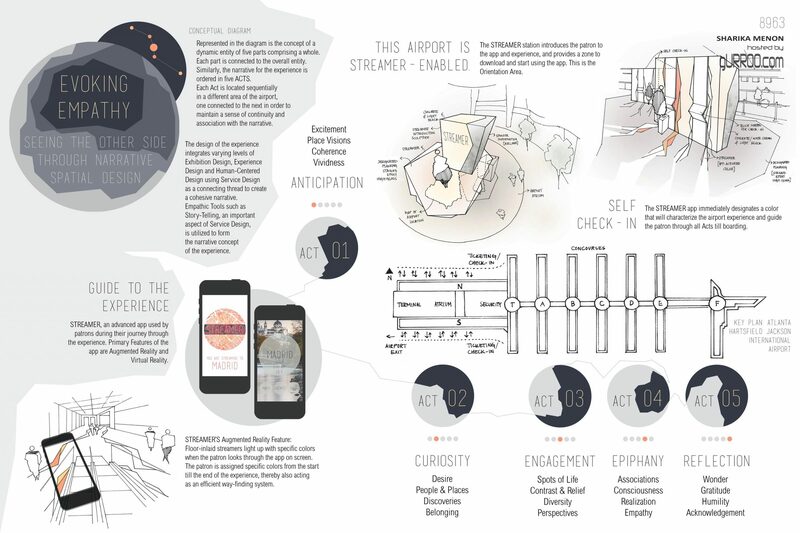 In order to move beyond the means by which news and current events are portrayed through current forms of media, the design of a physical environment that has the ability to connect people to current events on a global scale is explored. The project delves into a novel approach of a dynamic, narrative environment to highlight news and current events within a larger contextual, cultural and global understanding. 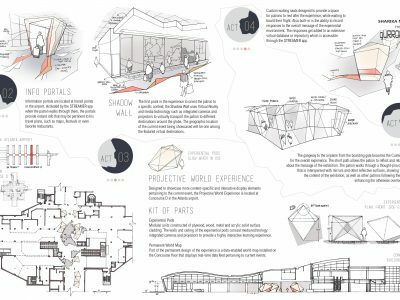 This is compassed by utilizing exhibition design theories with empathic design principles, particularly using virtual phenomenon such as Augmented and Virtual Reality within Interior Design theories. 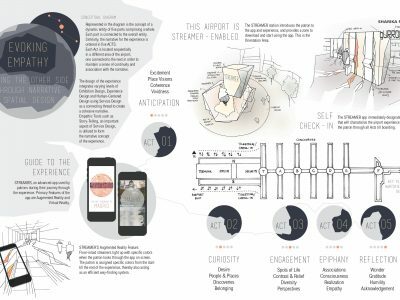 The intent of the design is to evoke levels of empathy within individuals who experience this narrative environment, creating multiple global perspectives and heightened awareness through a prototypical physical setting situated in the Hartsfield Jackson Atlanta International Airport. 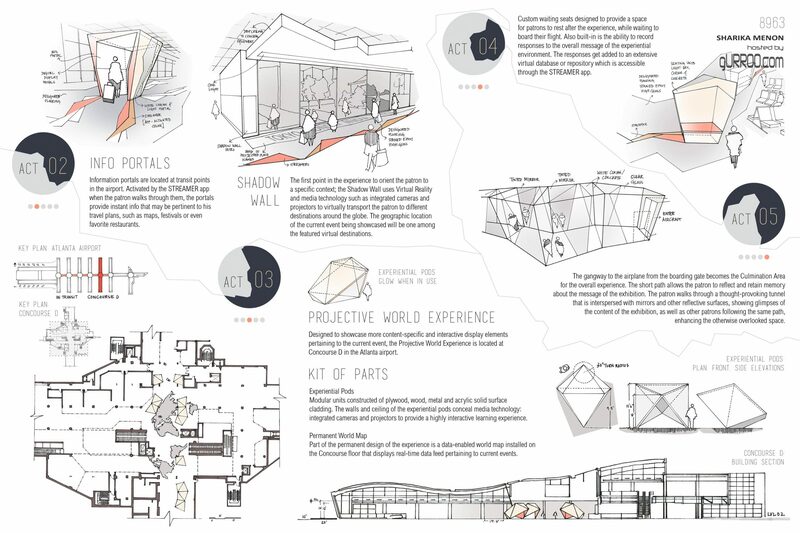 Understanding it as a prototypical setting, it may be noted that the design is site-relevant but not site-specific. The nature of the permanent exhibits and temporary elements allow it to be adapted to various other high-traffic zones such as city centers and malls, to compile a virtual repository of global perspectives and information that may be utilized at a later stage.